Pituitary adenomas: These are tumors that proceed from the hormone-secreting cells of the anterior lobe of the pituitary gland. 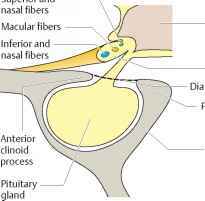 As they increase in size superiorly, they reach the anterior margin of the chiasm where they compress the inferior and nasal fibers that cross there (Fig. 14.5). This leads to an initial visual field defect in the superior temporal quadrant that may later progress to complete bilateral temporal hemianopsia. The visual field defect usually spreads in an asymmetrical pattern. The eye with the more severe visual field defect often exhibits the lesser central visual acuity. Fig. 14.4 Sagittal section of the optic chiasm. See text for details. Fig. 14.5 The visual field defect begins as a bilateral superior temporal defect and may progress to complete bilateral temporal hemianopsia. 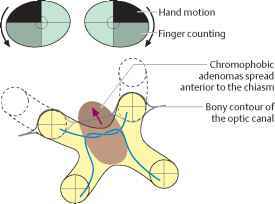 The terms "finger counting" and "hand motion" describe the patient's visual perception. — Superior compression of the optic chiasm by a craniopharyngioma. Fig. 14.6 The visual field defect begins bilaterally in the inferior temporal quadrants and can progress to complete bilateral temporal hemianopsia. Craniopharyngioma riorly and therefore primarily affect the superior nasal fibers that cross there (Fig. 14.6). The corresponding visual field defect begins in the inferior temporal quadrants and then spreads into the superior temporal quadrants. Meningiomas. These are tumors that proceed from the arachnoid. 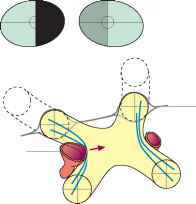 They may affect various different parts of the chiasm depending on the site of their origin (Fig. 14.7). When they occur on the tuberculum sellae, they can compress either the optic nerve or the chiasm. 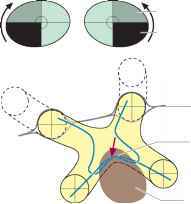 Tumors that compress the junction of the optic nerve and chiasm simultaneously compress the fibers in the arc of Wilbrand. In addition to the ipsilateral central scotoma, this produces a contralateral visual field defect in the superior temporal quadrants. Meningiomas can also proceed from the margin of the sphenoid and compress the optic nerve. Those that originate along the olfactory tract can lead to a loss of sense of smell and to compression of the optic nerve. Aneurysms. Dilation of the internal carotid artery due to an aneurysm can result in lateral compression of optic chiasm (Fig. 14.8). The resulting visual field defect begins unilaterally but can become bilateral if the chiasm is pressed against the contralateral internal carotid artery. Initially there is ipsilateral hemianopsia extending nasally. This is followed by compression of the contralateral side with contralateral hemianopsia that also extends nasally. Other changes in the chiasm. Aside from the external effects on the chiasm, changes can occur within the chiasm itself. These include gliomas, demyeli-nation, and trauma. The chiasm can also be involved in infiltrative or inflammatory changes of the basal leptomeninges (arachnoiditis of the optic chi-asm). The resulting visual field defects are highly variable. — Possible compression of the optic nerve by a meningioma. Lateral compression of the optic chiasm by an aneurysm in the internal carotid artery. Fig. 14.8 The visual field defect begins on the same side as hemianopsia extending nasally and can progress to bilateral nasal hemianopsia. Symptoms, diagnostic considerations, and clinical picture: The compression of the optic nerve produces primary descending atrophy of the optic nerve. This is associated with a more or less severe decrease in visual acuity and visual field defects (see Etiology). A visual field defect consisting of heteronymous bilateral temporal hemianopsia is referred to as chiasm syndrome. 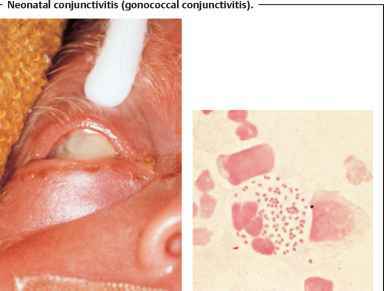 The visual field defects in these cases are frequently incongruent. Chiasm syndrome develops slowly and usually represents the late stage of a pituitary adenoma or craniopharyngioma. H Heteronymous bilateral temporal hemianopsia with decreased visual acuity and unilateral or bilateral optic nerve atrophy is referred to as chiasm syndrome. Bilateral temporal visual field defects are typical for chiasmal processes. However, the many possible locations of lesions in the region of the chiasm produce widely varying visual field defects depending on the specific etiology. H Bilateral temporal visual field defects are due to chiasmal lesions. A chiasmal lesion should always be considered in the presence of any uncertain visual field defect. Further diagnostic studies may be performed after visual acuity testing, pupillary light reaction testing, perimetry, and ophthalmoscopy of the fundus and optic disk. Such studies include radiographs of the sella turcica (to detect enlargement or destruction of the sella turcica due to a pituitary adenoma), CT, MRI, carotid arteriography, and, in applicable cases, endocrinologic studies. Treatment: This depends on the underlying cause. Neurosurgery may be indicated or medication, such as bromocriptine for a pituitary tumor. Prognosis: This also depends on the underlying disorder. Ocular functional deficits may subside when the disorder is promptly diagnosed and treated.